There’s nothing like a looming Google penalty to get everyone sitting up in their chairs with their eyes wide open. How long have we been telling you about the importance of responsive websites? How long, I ask you? But have you listened? Noooooo. When Google sent out warnings to webmasters in January to ensure the conversion to responsive sites, did you listen? Did you even pretend to take that notification seriously? And now you’re facing a penalty from Google – right. in. the. eye. So, in case you missed it, Google’s getting ready to roll out a new penalty to sites that are out of compliance with mobile best practices. 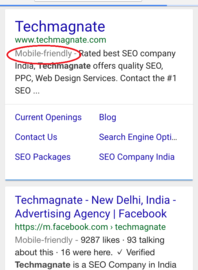 According to Google’s blog update, mobile-friendliness and relevant app content in search results will be regarded as ranking factors beginning April 21st, 2015. This move aligns with the increased use of mobile devices, in the US and globally and Google is quite clear about the fact that it will always place usability and content relevance ahead of all other tactics or strategies used to get ahead with SEO rankings. And now, by rewarding sites that have made responsiveness a priority, Google is making sure that the rest of the world follows along. Spend a couple of seconds to test your site through Google’s Mobile-Friendly Test. You don’t believe me? Here. Look. If your site’s search results show up with a “Mobile-friendly” tag, then Google’s anointed your site and you’re well out of the woods. If you’ve managed to pass both these tests, then give yourself a pat on your back and carry on with business as usual.